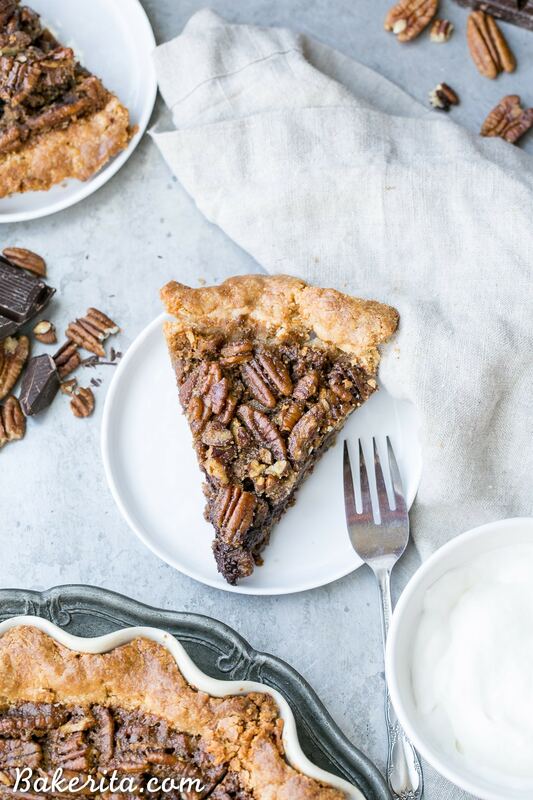 This Paleo Chocolate Pecan Pie has a flaky grain-free pie crust and a layer of chocolate ganache! This gluten-free and refined sugar-free pie is gooey, crunchy, and the perfect addition to your holiday dessert line-up. So, I have a pie recipe that you’ve got to add to your Thanksgiving line-up. It’s not just me insisting it – I just got a FaceTime call from my Aunt Tara, dying to show me her lunch: a big slice of this chocolate pecan pie. She works with my dad, and I sent this pie along with some of my homemade twix bars to work with him. She was obsessing over it, declaring it the best thing I’ve ever made and insisting it be made again for Thanksgiving. She’s had a LOT of the things I’ve made over the years, so that’s saying a lot. Needless to say, it’ll definitely be making an appearance on our Thanksgiving dessert table. Pecan pie has always been one of my favorite Fall pies, right up there with apple. 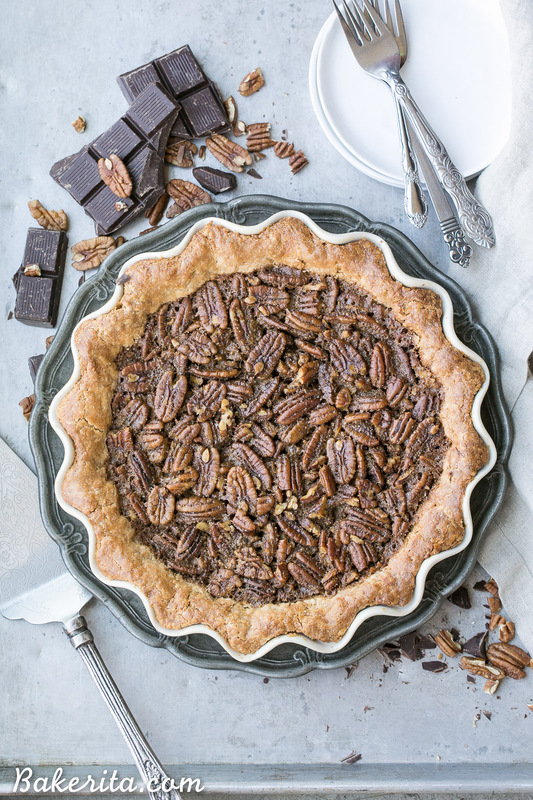 In fact, I already have two pecan pie recipes on Bakerita – this less healthy but delicious brown butter pecan pie, and this paleo pecan pie. I couldn’t help but create another version for this year’s Thanksgiving, and chocolate (as usual) was calling to me. 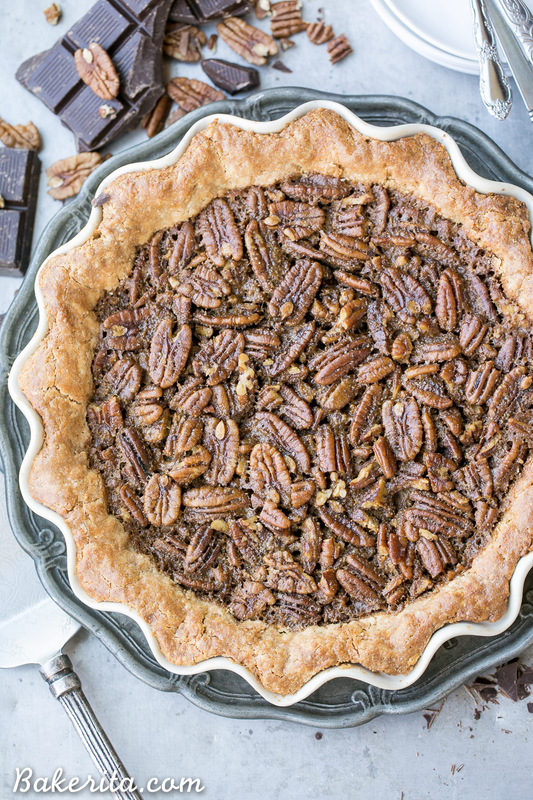 To give this pecan pie a chocolatey twist, a layer of rich chocolate ganache is spread on the bottom crust before the pecan filling is added. After it bakes up, you get this nice gooey layer of chocolate in the midst of the pecan-packed filling. So swoon-worthy. I love the crust recipe that I used here too – it’s super flaky, and as far as grain-free pie crusts go, pretty easy to work with. And bonus! If its breaks, you can press it back together super easily. There’s no gluten to overwork, so small chance of a super tough crust. The filling is obviously corn syrup free, instead using maple syrup and coconut sugar to sweeten. In most pecan pies, I hate the weird gelatinous layer of sugary goo, but in this one, it has flavor and while it’s sweet, it isn’t cloyingly so. 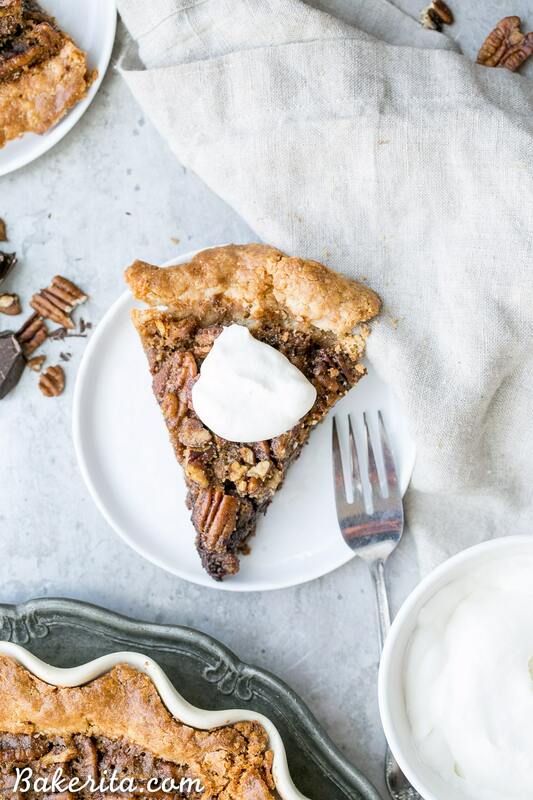 This chocolate pecan pie has got to be well chilled before you cut into it, or you might have a gooey mess on your hands. I was impatient in cutting the pie in the pictures, which is why my slices aren’t perfect. If you have more patience than me, you’ll have beautiful slices! This can definitely be made the day before serving, and I’d recommend doing so. I sprinkled on a bit of Maldon flaky sea salt after I took pictures (oops) and it gave a little salty bite that I’m a big fan of (my aunt also loved the salt, in case you were wondering ). Besides that, a bit of unsweetened whipped cream or coconut cream is really all you need to pair with this. Pair it with this paleo pumpkin pie for some healthier but oh so delicious Thanksgiving desserts :) hope you love this one! Enjoy! Combine the almond flour, tapioca flour, coconut sugar, salt and butter in a food processor, or use a pastry blender in a bowl. Pulse or blend until the texture of coarse meal. Add 1 egg and pulse/mix again until dough comes together. If you’re mixing in a bowl, you may want to use your hands to bring the dough together at the end. Press the dough into a disk and wrap in plastic wrap. Turn out the dough onto a piece of plastic wrap and refrigerate for at least 1 hour or up to a few days. When ready to bake, roll out your dough in between two sheets of parchment into a 12-inch circle. Lay dough into a 9-inch pie dish (NOT deep dish) and place in the freezer while you prepare the filling. Place the finely chopped chocolate in a bowl. Microwave the coconut milk until it’s bubbling, about 30 seconds. Pour over the chopped chocolate, making sure all of it is submerged, and let stand for 1 minute. Whisk until smooth. Spread the chocolate ganache evenly on the bottom of the frozen pie crust and return to the freezer. In large bowl, beat the eggs until slightly foamy. Stir in the coconut sugar, maple syrup, and coconut oil. Whisk together until fully combined. Stir in the almond flour, almond milk, vanilla and salt. Add the pecans and stir until they are fully coated. Remove the pie crust from the freezer and fill with the pecan filling. Bake in the preheated oven at 325°F and bake for 45-50 minutes, or until the top no longer jiggles in the center. Let cool on a wire rack for one hour, and then move to the refrigerator to cool completely before slicing and serving. Although not pictured, I ended up sprinkling on some flaky Maldon sea salt at the end after tasting the pie. It's totally optional, but delicious. What a pretty pie! You know I just realized I’ve never had a pecan pie. The salt on top sounds incredible! 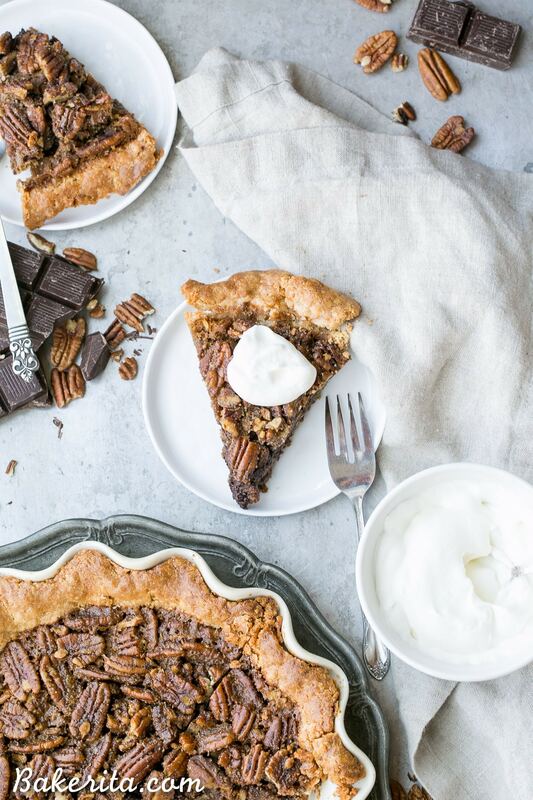 Pecan Pie is one of my favorite’s; and you added chocolate which makes it even better!! Doesn’t chocolate make everything better?! Thanks, Joanne! Made this and the paleo pumpkin pie today! Amazing! I LOVE your Paleo recipes!!! I am so excited to try this one. Question – do you think I could substitute anything for the butter? We lean more Whole 30 than Paleo, but I can get behind that maple syrup and coconut sugar ;) – but I’m not sure if I can get the right kind of butter to make this pie tomorrow. Hi Amber! You could use coconut oil instead of the butter, just make sure it’s in solid form. I’d put it in the fridge to make sure it’s fully hardened before using. You could also probably cut down on the coconut sugar a bit if you want to make this more Whole 30 friendly. Thanks so much for your kind words – so glad you like my site! I hope you love this recipe. Perfect!! Coconut oil it is. Thank you!! This looks amazing! I have two questions for you though. First, how maple syrupy does the finished pie taste? 1/4 cup doesn’t seem like much but I absolutely can’t stand that flavor or even the smell so if it has even a hint of maple syrup flavor it’s a no go for me. And second, if I do need to substitute something else for the maple syrup, do you have any recommendations? Really looking forward to trying this pie! I have a Girls Night holiday party coming up in a couple weeks and I need to accommodate both a request for no refined sugar and a need for gluten free so this would be perfect! Hi Stephanie. I didn’t notice too much of a maple flavor, but if you really hate it, you can replace with honey. I hope that you enjoy it – sounds like Girls Night will be fun! Hi! This recipe sounds yummy and I want to make it for this thanksgiving. I was wondering if I could sub the almond and tapioca flour for the pie crust and use gluten free all-purpose flour instead? Hi Shannon. I don’t use gluten-free AP flours very often because they all vary so much based on ingredients – it most likely would be fine, but since I haven’t tried it, I can’t make any guarantees. You somehow make the most decadent-yet paleo-desserts ever. Time and time again. Magic. This looks DELISH! Two questions, could I use milk chocolate instead of dark for the ganache? Dark chocolate isn’t my favorite, so I just wanted to ask. :) also, could I sub butter for the coconut oil? If so, what would the ratio be? I don’t have to worry about dairy free, and I love me some butter. ;) thanks!! Hoping to make this for Thankgiving this year! Hi Sarah, it helps the filling to set up and not be too gooey. You could definitely use GF AP flour if it’s what you’ve got on hand. Enjoy! Hi Sarah, no worries! Yes I use canned unsweetened coconut milk. Any kind of high-quality chocolate that you like will do the trick. Turbinado might be a little too coarse…if have brown sugar that would work, or you could pulse the turbinado sugar in a blender to make it more fine. I hope you love it! Perfect, thank you! I’ll be making this tomorrow, do I store it in the fridge overnight, or on the counter? I’d recommend storing in the fridge! Hi! I am a baking beginner and making your pie today! I refrigerated the crust dough overnight. I took it out to start working with it this morning and I think I let it warm up too much. When I rolled it out, the crust fell apart easily and I couldn’t peel it off the parchment paper. So I shaped it back into a disk and put it back in the fridge again. Hopefully it will work! Do you have any other thoughts or suggestions? Thanks! Hi Liz, it definitely helps to have a cooler crust when you’re rolling out or it will fall apart easily, as you experienced. Since there’s no gluten in it, it should be totally fine to chill and try again :) just make sure to keep it relatively cool while rolling out, and I like to roll out on parchment and then place the pie tin on top of the crust, and flip the whole thing over to make things easiest. It will break a little bit since there isn’t any gluten to hold things together, but you can press it back together with your fingers without issues. Hope this helps – Enjoy!! Thank you, Rachel! It still broke apart a bit then 2nd time. But I did the trick you mentioned, and it really helped. I just pressed the crust back into the pie dish. We’ll be digging in soon! The recipe was very easy to follow. Thank you! Hi Rachel! I’m excited to try out some of your recipes! Do you think flax egg or an egg replacer would work in this recipe? My son is allergic to eggs, as well as wheat & dairy.